In today's guest blog post Kauser Kanji, editor and founder of VOD Professional, explores some of the most innovative functionality found in video user interfaces today. Spotting common functionality in video user interfaces (VUIs), and rules for how they're constructed, is something that I've been doing a lot of lately. Having studied more than 180 global video services for VOD Professional's VUI Library research tool, I've found that there are 25 functions that commonly appear in VUIs across all platforms: on Web, tablet, smartphone, game console and connected TV. You can see some of my original research here. For the purposes of this blog post, however, I want to take a look at some cool features that are only occasionally included in video services. Perhaps they are few and far between because they're new and innovative, or because there are specific issues preventing wider adoption--or maybe it's simply because the technologies are yet to go mainstream. Regardless, these features could offer a glimpse of what we can expect from the next generation of VOD services. Load up Netflix on your connected TV and start watching a movie. Stop after five minutes and turn your television off. Now fire up Netflix on your iPad and find the movie again. Press play. Netflix will ask you if you want to resume where you left off. This is a good example of joined-up first screen / second screen thinking. We hear a lot about "curated content" on the internet and video services are no different. The BBC and Blip TV, for example, are two companies that are proud of the human, non-algorithm based way in which they recommend content to viewers. The Smithsonian Channel on iPad takes this concept a step further and gives you the ability to curate, and indeed create, your own channel by choosing from a list of topics. Judging by its current iTunes App Store score (4.5 stars out of 5 from 1,240 ratings), users are highly satisfied. Touch the "Inspire Me" option on the TED iPad app and you're taken to a page which says "Let serendipity guide you to a playlist of undiscovered talks." It's a little like Google’s "I’m feeling lucky" functionality and is a novel way of surfacing content. Missed the start of your favourite programme? No problem. 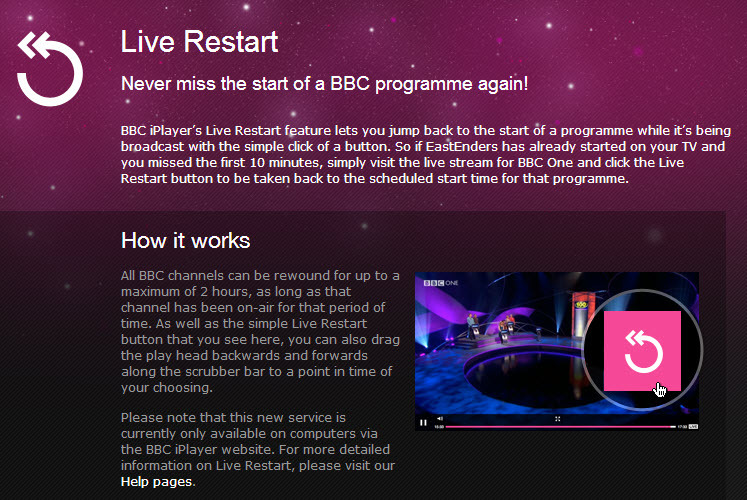 Just click on "Live Restart" on the BBC iPlayer website and watch up to the last two hours of linear television. 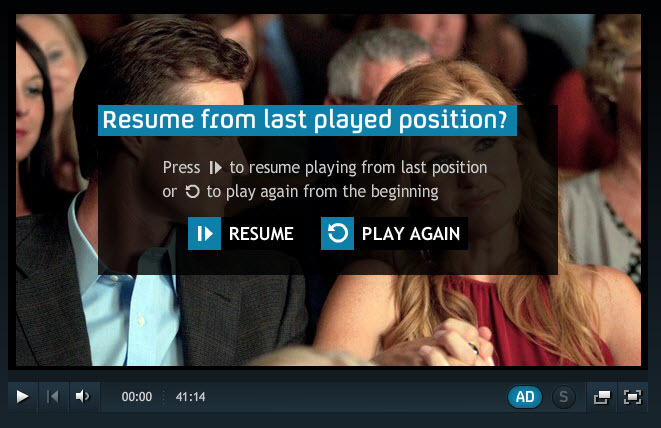 You'd think that this would be a no-brainer and fairly easy to do technically but many of the services that we've looked at still don't let you resume a show from where you last stopped watching it. While the current version of Netflix gets only 2.5 out of 5 stars from 117 ratings on the UK iTunes App Store (mainly due to playback problems after the last update), the service undoubtedly includes some great functionality. One of the best is social content recommendation. By linking my Netflix account to Facebook I can see what my friends are watching and what, therefore, I might like to take a look at. Accessibility options – subtitles, closed captions, changing text sizes within apps – on most of the video services we've looked at are woefully lacking. Only 22 percent of the 57 services we've surveyed on iPad and just 11 percent of Android tablet products have any accessibility features. The 4oD website however has taken a welcome lead in this area. The company is committed to making 4oD as accessible as possible across all platforms. Audio-described shows currently make up about 5 percent of its content but that number is rising. VOD Professional is a publication for anyone in VOD, IPTV and Connected TV. Kauser is also a VOD professional himself, having worked as Head of Online at NBC Universal and as a senior project manager at ITN. For more information visit: www.vodprofessional.com or follow @vodprofessional on Twitter.